When an organisation embarks on radical change, a representation of how the organisation is proposed to operate in the future may be required in the form of a Target Operating Model (TOM). Developing a TOM is a cross functional team effort with, for example, the finance function describing how financial processes and systems support the business and its regulatory obligations. A fully developed TOM will usually comprise a graphical representation with supporting explanatory documentation. This article provides some ideas from practical experience of how to develop a TOM and the particular issues for finance. Furthermore, it considers why TOMs often have a completely different look and feel from each other despite using a common development framework. This development framework is structured around the various dimensions that comprise any organisation, rather like the musical instruments that form an orchestra. Process – describing the grouping and scope of activities, customers, products, controls and rule sets in support of the customer lifecycles and value propositions. The customer value propositions describe each type of customer, what they value and are prepared to pay for. Operating Units – describing the objectives, scope and locations, where relevant, for each type of operating unit. The operating units may, for example, be call centres in differing geographic locations, manufacturing plants, shared service centres or outsourced facilities. Technology – the systems and other technologies required to support the business processes and deliver the customer value propositions. People – profile of the resource requirements, characteristics of desired attitudes and behaviours, skills and competencies. Organisation structures –legal and operating units, divisions, functions and reporting lines. Implementation Road Map – setting out the timescales, risks, phasing and programme management required to implement the TOM. Performance Management – uniquely blends all the dimensions together, enabling the organisation to be coherently managed to meet its objectives. This is similar to the way a conductor will lead musicians in an orchestra and rehearse to play either Bach or Gershwin. The scope of finance activities? What is a finance activity and where does “finance” begin and end? This will not be obvious as activities that will have a financial impact, may be carried out by business operational staff. Such staff will not report to the finance function and may be unaware of the accounting impact of their activities, for example, insurance claims processing, customer account opening, credit underwriting and control. Development of a TOM may also highlight the dependency of finance on the seamless flow of transactional data between business and financial systems. It is not unusual to discover that a large proportion of finance resources are consumed in reconciling accounting transactions with real world transactional events recorded on the business systems. For example, reconciling claims recorded as paid by the accounting system with those recorded on the claims insurance system. Such reconciliation activities merely highlight the air gap and lack of integration between systems. Such air gaps may be easy to design out of the “logical” TOM but will need to be followed through in the “physical” TOM in terms of investment in changes to systems and processes. Depending on the purpose of the TOM and the constraints of time and complexity, it may be that not all the dimensions need to be addressed at the same time. A phased approach can be taken, in order to develop a representation that is fit for purpose, that is when enough has been achieved in order to make some progress. Despite the use of a common framework in developing the TOMs, the resulting look and feel of each TOM can be very different. On reflection, this should be no surprise as TOMs are an outcome of the type of organisation, the design principles, the primary driver for change and the point at which the TOM is considered to be fit for purpose. Front line personnel often confuse working hard and conformance with procedures as evidence of customer service. The more difficult challenge is to work out customers’ real needs and what they truly value and are prepared to pay for. The start point for the TOM is, therefore, likely to be focused on the process dimensions with the development of differentiated customer value propositions, customer lifecycles and supporting processes. It is often easier for organisations to establish new divisions, departments and functions than to close them down when no longer adding value, which may not be obvious. This can be due to a combination of the organisational units’ naturally having a vested interest in prolonging the life of their operations, allied with budgeting systems that may challenge proposed new investments but not the existing cost base. Over time, a poorly structured organisation creates frictional costs and frustrations in trying to manage and hold it together, that can no longer be ignored. The start point for the TOM may, therefore, be focused on the organisation structures and process dimensions with the development of a coherent logical process and organisational design. Obtaining economies of scale and cost saving synergies will often be a key benefit to be realised from any business merger or acquisition. However, it will be important to ensure that there is a complete understanding of what is critical to preserve from the old to the new integrated organisation. This may encompass strategies for administering the current book of business, maintaining legacy systems, developing new business and preserving customer relationships. The start point for the TOM may, therefore, be the organisation dimension in developing the structure for the integrated business, before moving on to the process and technology dimensions to design the supporting process and system designs. As organisations evolve, they will, at some point, find they have a disparate portfolio of systems and processes that become inefficient and costly to maintain. However, the design of a rationalised system design is often easier said than done, as systems are at the heart of even the smallest of organisations and any heart intervention can be life threatening. The start point for the TOM will, of course, be the technology dimension, closely followed by the process and people dimensions. When cost/income ratios and shareholder returns become uncompetitive and unsustainable, action may be required as a matter of survival. Very often, this translates into a sole focus on reducing headcount or across the board cuts rather than a more considered approach across all the organisational dimensions. Aside from the wholesale closure of a business unit, any form of headcount reduction based upon a selection process, must be done in a way that is seen as being fair and equitable e.g. performance evaluation. The start point for the TOM will often, therefore, be the people dimensions, to determine the future resource requirements, culture and accountabilities. A particularly far-sighted or desperate management may wish to completely transform the business by addressing the why, how and where it generates value. Such an approach will, of course, necessitate addressing all the dimensions of a TOM, driven by a clear business model. The physical delivery of such a TOM, will also require a particularly well constructed and supported implementation road map. The start point for the TOM is likely to be the process dimension to ensure that the customer value propositions and lifecycles to deliver the strategy and business model are clarified and understood. Such clarity will ensure that systems, processes and structures have a customer focus. Understanding the various dimensions may provide a conceptual start point for describing what a TOM is but not how to start the process of its development. Stakeholders must take ownership of the TOM which needs a participative approach across the organisation, ideally via a project team comprising a mix of full and part-time stakeholder representatives. A workshopping approach to the TOM development should be considered, as it enables the collaborative participation and mixing of stakeholders and personnel at all levels. This is an effective mechanism, to not only solving issues but building team spirit and spreading knowledge around the participants, who may not normally work together. The input of external suppliers, customers and intermediaries is also crucially important as organisational boundaries become blurred with the increasing use of outsourcing. The trend to outsource previously in-house responsibilities for back-office functions, manufacturing and logistics means that contract and relationship management becomes a core competence. The development of a TOM to describe new ways of working provides a unique opportunity to have a conversation with external stakeholders in a different way from what they are used to. This conversation should be through the project team and not the normal relationship management route, be it a salesman, account, procurement or contract manager. The focus of the conversation is around walking in the customer’s/supplier’s shoes to understand the nature and quality of the interaction between them and the organisation. Typically, customers welcome the opportunity to talk confidentially and openly about the relationship to someone whose motivation is not to sell them more products. Suppliers also welcome the opportunity to convey the trade-offs they may be forced to make in dealing with a procurement function that may be solely focused on price, without regard to service and the security of the supply chain. Understand at the outset, the strategic and business driver for the change that is driving the TOM. Understand the value that the organisation wants to deliver to its customers. Identify the customer lifecycle and the key points of customer interactions. Produce the TOM in two stages; the logical design before delving into the detail of the physical delivery systems and processes. During the logical phase, think process in order to cut across functional silos. For example, finance processes and activities should be followed through to the management and business operational processes and not stop at the boundary of the finance function. Identify the distinctive skills and competencies required to deliver value to customers. 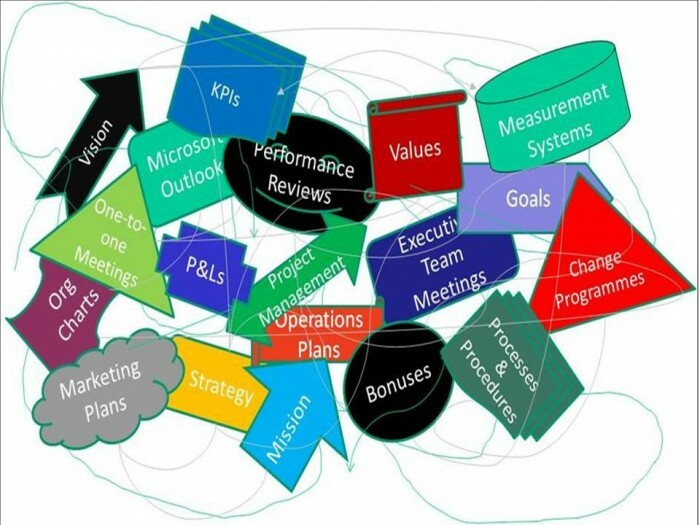 Model the whole business within scope, not just particular functions. The development process must be inclusive and participative, involving end customers and intermediaries. Time is of the essence in managing expectations; have major milestones no longer than three months. 10. Produce a gap analysis explaining how life will be different between the current and future TOM. Plan how this gap will be bridged. As well as pressure for increased efficiencies, finance functions are increasingly being challenged with responsibility for developing a finance TOM and realising the due diligence benefits arising from acquisitions. A TOM design approach provides finance with the opportunity for fresh thinking and to more fully integrate finance and business activities and so remove wasteful activities and associated costs. Finally, of course, the development of a TOM is more an art than science so artistic flair and inspiration plays an important part in its final representation. This representation, however, can prove less important than the process of collaboration, participation, challenge and consensus building created across the organisation in its development. It’s the journey and not just the destination that often delivers the real benefit!